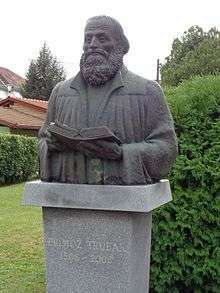 Primož Trubar or Primož Truber[nb 2] ( pronunciation ) (1508[nb 1] – 28 June 1586) was the Protestant reformer, most known as the author of the first Slovene language printed book, the founder and the first superintendent of the Protestant Church of the Duchy of Carniola, notable for consolidating the Slovene language. Trubar is the key figure of Slovenian cultural history and in many aspects a major historical personality. 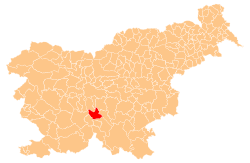 Trubar was born in the village of Rašica (now in the Municipality of Velike Lašče) in the Duchy of Carniola, then under the Habsburgs. In the years 1520–1521 he attended school in Rijeka, in 1522–1524 he continued his education in Salzburg. From there he went to Trieste under the tutorship of the Roman Catholic bishop Pietro Bonomo, where he got in touch with the Humanist writers, in particular Erasmus of Rotterdam. In 1527 the bishop Pietro Bonomo assigned Trubar a priest position in Loka pri Zidanem Mostu. In 1528 he enrolled at the University of Vienna, but did not complete his studies. In 1530 he returned to the Slovene Lands and became a preacher. He gradually leaned towards Protestantism and was expelled from Ljubljana in 1547. 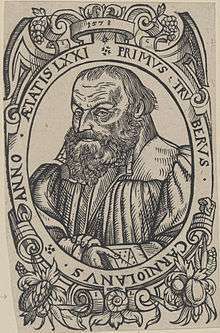 In 1550, while a Protestant preacher in Rothenburg, he wrote the first two books in Slovene, Catechismus and Abecedarium, which were then printed that year in Schwäbisch Hall by Peter Frentz. Catechismus also contained the first Slovene musical manuscript in print. Altogether, Trubar authored 22 books in Slovene and two books in German. He was the first to translate parts of the Bible to Slovene. After the exhortation by Pier Paolo Vergerio, he translated the Gospel of Matthew in 1555 and until 1577 in three parts published the translation of the entire New Testament. In period between 1561 and 1565 Trubar was the manager and supervisor of the South Slavic Bible Institute. Trubar died in Derendingen, Holy Roman Empire (now part of the city of Tübingen, Germany), where he is also buried. The monument to Primož Trubar by Franc Berneker. White marble, 1910. The statue stands in Trubar Park opposite the Museum of Modern Art in Ljubljana. In 1986, the Slovenian television produced a TV series, directed by Andrej Strojan with the screenplay written by Drago Jančar, in which Trubar was played by the Slovenian actor Polde Bibič. Trubar was commemorated on the 10 tolar banknote in 1992, and on the Slovenian 1 euro coin in 2007. In 2008, the Government of Slovenia proclaimed the Year of Primož Trubar and the 500th anniversary of Trubar's birth was celebrated throughout the country. A commemorative €2 coin and a postage stamp were issued. An exhibition dedicated to the life and work of Primož Trubar, and the achievements of the Slovenian Reformation Movement was on display at the National Museum of Slovenia from 6 March to 31 December 2008. In 2009, the Trubar Forum Association printed Trubar's Catechism and Abecedarium in modern Slovene, in a scholarly edition that includes both the Trubar-era Slovene and the modern Slovene translation with scholarly notes. The "Sermon on Faith", a portion of the Catechism, is available in modern Slovene, English, German and Esperanto. Since 2010, 8 June is commemorated in Slovenia as Primož Trubar Day. Google celebrated his 505th birthday anniversary with a dedicated Google Doodle. Catechismvs. V slouenskim Iesiku sano kratko sastopno Islago. Inu ene Molytue tar Nauuki Boshy. Vseti is zhistiga suetiga pisma. Državna Založba Slovenije. 1555. Ta slovenski kolendar kir vselei terpi: inu ena tabla per nim, ta kasshe inu praui try inu sedemdesset leit naprei... Cankarjeva založba. 1557. Catechismus, mit Außlegung, in der Syruischen Sprach. Ulrich Morhardt. 1561. Ena duhovska peissen subper Turke inu vse sovrashnike te Cerque Boshye. Cankarjeva založba. 1567. Kerszhanske leipe molitve sa use potreibe inu Stanuve, na usaki dan skusi ceil Tiedan, poprei v Bukovskim inu Nemshkim Jesiki, skusi Iansha Habermana pissane, Sdai pak tudi pervizh v Slovenskzhino stolmazhene, Skusi Iansha Tulszhaka. Skusi Iansha Mandelza, utim Leitu. 1579. Wikimedia Commons has media related to Primož Trubar. 1 2 The exact date of Trubar's birth is unknown. In different encyclopedias and lexicons, it is given as 8 June 1508 or 9 June 1508, as June 1508 or simply as 1508, the last being the only reliable information. ↑ Primož Trubar used the version Truber throughout his life, except in 1550 when he used Trubar. 1 2 3 4 Voglar, Dušan (30 May 2008). "Primož Trubar v enciklopedijah in leksikonih I" [Primož Trubar in Encyclopedias and Lexicons I]. Locutio (in Slovenian). 11 (42). Maribor Literary Society. Retrieved 7 February 2011. ↑ "Trubar Primož". Slovenian Biographical Lexicon. Slovenian Academy of Sciences and Arts. Retrieved 25 April 2013. ↑ "Trubar Year Dedicated to Father of Slovenian Written Word (feature)". 2 January 2008. Retrieved 7 February 2011. ↑ Ahačič, Kozma (2013). "Nova odkritja o slovenski protestantiki" [New Discoveries About the Slovene Protestant Literature] (PDF). Slavistična revija (in Slovenian and English). 61 (4): 543–555. ↑ Society 1990, p. 243. ↑ "The Year of Trubar 2008". Coordinating Committee for State Celebrations, Government of Slovenia. Protocol of the Government of the Republic of Slovenia. Government of the Republic of Slovenia Communication Office. Retrieved 7 February 2011. ↑ "The Euro – €2 Commemorative Design 2008 – Slovenia". 22 May 2008. Retrieved 22 May 2008. ↑ "Prominent Slovenes". Post of Slovenia. 22 May 2008. Retrieved 7 February 2011. ↑ "First Slovenian Book Available in Modern Slovenian". Slovenian Press Agency. 23 October 2009. ↑ "Slovenia Gets Primoz Trubar Day". Slovenia Press Agency. 18 June 2010. Retrieved 7 February 2011. ↑ "Doodles/2013". Google inc. Retrieved 8 June 2013. Society (1990). Slovene Studies: Journal of the Society for Slovene Studies. The Society.